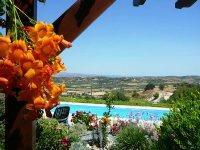 Stroumbi property for sale brought to you by Cyprus 101 - Paphos, Cyprus real estate leaders. Stroumbi village has history that dates back to 5000 BC. Located 15 kilometers from Paphos it sits halfway between Paphos town and Polis in the middle of wine country near Kathikas and Polemi, Cyprus. The village has restaurants, petro station, police station. The Tsada / Minthis Hills Golf Course is also minutes away. Stroumbi sits above an elevation of 400+ metres which allows for many fantastic views of the mountains and the sea. "Insulated, Damp Proof Course, Deeds & More! "